David Tennant will be a guest at Wales Comic Con fan convention on Saturday 27th April. 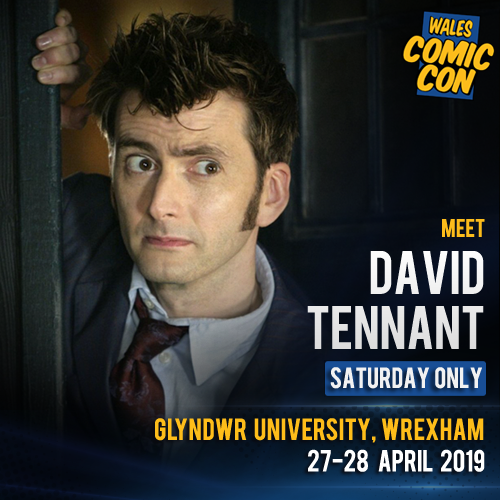 This will be David's first appearance at a fan convention in Wales. The fan convention will take place at Glyndwr University which is located at Mold Road, Wrexham, LL11 2AW. Wales Comic Con fan convention runs from Saturday 27th April to Sunday 28th April. However David will only attend on the Saturday. David Tennant will have various photo ops and autograph sessions. David is also expected to attend a Question And Answer panel but that has not been scheduled yet. Billie Piper will also attend the fan convention on Saturday 27th April and she will share photo ops with David. The dual photo ops are �9.80 and solo is �.60 plus a ticket for the con itself is also required. Link to posts related to David Tennant at Wales Comic Con on Blogger.com (usually with more details). David Tennant to attend Wales Comic Con fan convention on Saturday 27th April.